Going There: The Future Of Water Western states like Colorado are balancing competing demands for waterways. When different groups find themselves at odds, how can water resources be divided fairly? The Colorado River has been a major source of water in the Southwestern United States region, but many worry that it's beginning to dry up. Some observers point to population growth, climate change and water mismanagement as causes in discussions regarding the dwindling river. Could the water crisis that has struck many Western states be a sign of what's to come for the rest of the nation? And who decides how much water is used or who controls it? Tuesday, May 24, I'm in Fort Collins, Colo. to dive into these issues. In collaboration with member station KUNC, Going There: The Future of Water will feature a night of spirited discussion and performances. We also take the conversation to social media with a live Twitter chat, beginning at 6:00 p.m. Eastern Time, using the hashtag #NPRH2O. 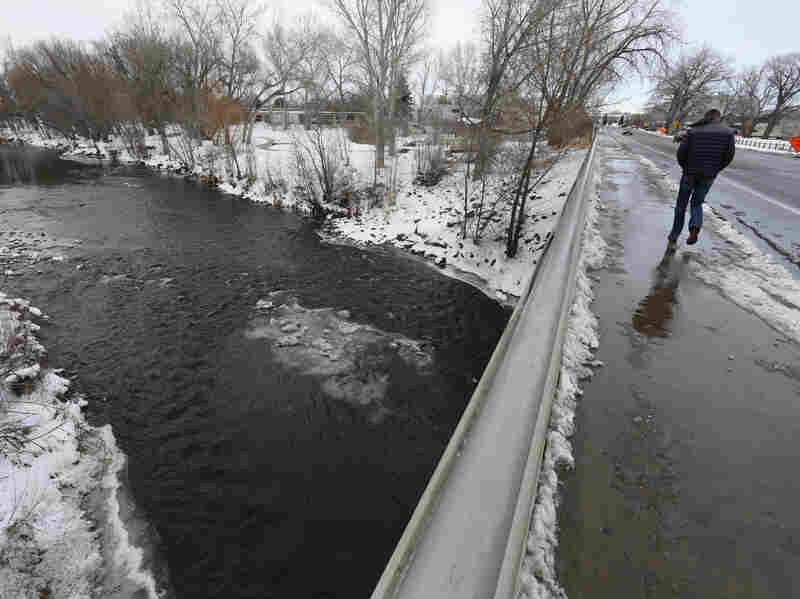 A man crosses a bridge over the Poudre River, in Fort Collins, Colo. The picturesque river is the latest prize in the West's water wars, where wilderness advocates usually line up against urban and industrial development. Ashley Ahearn, @aahearn, the environment reporter at member station KUOW and part of the regional multimedia collaborative project EarthFix. Drew Beckwith, @DrewBeckwith, a water policy manager for Western Resource Advocates. He works closely with water providers, state officials and partner organizations around the Intermountain West to find sustainable ways to meet human and environmental water needs. Stephanie Malin, @stephmalin_soc, an environmental and natural resource sociologist at Colorado State University. She focuses on natural resource extraction, energy development, water and their relationships to global political economies. Luke Runyon, @LukeRunyon, a reporter for member station KUNC based in Fort Collins. He primarily reports on local food systems, cattle and agricultural technology. Paolo Bacigalupi is a Hugo award-winning author of The Water Knife. Bacigalupi's writing has appeared in Wired magazine, High Country News, OnEarth magazine, The Magazine of Fantasy and Science Fiction, Asimov's Science Fiction magazine and on Salon.com. Kathleen Curry is a Colorado native and rancher who served in the Colorado Legislature from 2005 to 2010. Prior to serving in the Legislature, she managed the Upper Gunnison River Water Conservancy District. Roger Fragua of Jemez Pueblo in New Mexico has dedicated his professional career to the advancement and development of American Indian communities. Roger is currently the president of Cota Holdings LLC and ndnEnergy LLC. Both organizations are engaged in tribal development in the energy sector. Patty Limerick is the faculty director and chair of the board of the Center of the American West at the University of Colorado, Boulder, where she is also a professor of environmental studies and history. In addition, Limerick serves as the official state historian for Colorado State and was appointed to the National Endowment for the Humanities' advisory board and the National Council on the Humanities in 2015. Melissa Mays has proudly lived in Flint, Mich., since 2002, where she is a clean-water activist. With her husband, Melissa formed Water You Fighting For, an organization that connects activists with the stated mission of standing together against the loss of democracy and denial of clean, safe and affordable water.